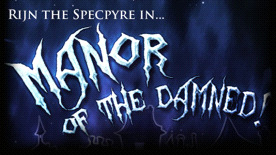 ﻿ Rijn the Specpyre in... Manor of the Damned! Engaging Story! You play a wandering vagabond swept up into the twisted lives of the immortal specpyres. Intense Action! Combine unique weapons to destroy relentless enemies and cunning monsters in this action RPG. Puzzles and Exploration! Only a sharp mind can unravel the secrets of the manor and the horrors of its past. Multiple Weapons! Dual wield weapons and items to combine their powers. Retro Style! Retro inspired sound effects and graphics. Awesome Soundtrack! Pounding industrial and eerie gothic music. Multiple Languages! Play in either English or Swedish.